Today is our FINAL reveal day for September and we saved our new Newton set for last! 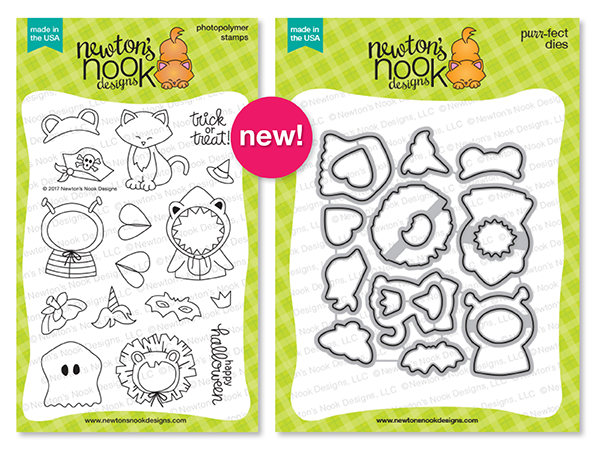 Newton is ready for Halloween in todays reveal of our Newton's Costume Party Stamp set! We are giving this stamp set away one lucky winner so make sure you read all the way to the bottom of this post to see how to win! Newton is ready to get dressed up in this 4x6 stamp set! We can't decide if Newton is most adorable as a shark, bumblebee or lion! Choose from a variety of fun costumes and hats to dress the kitty for Halloween greetings and more. Use the coordinating die set to make layering the outfits easy! 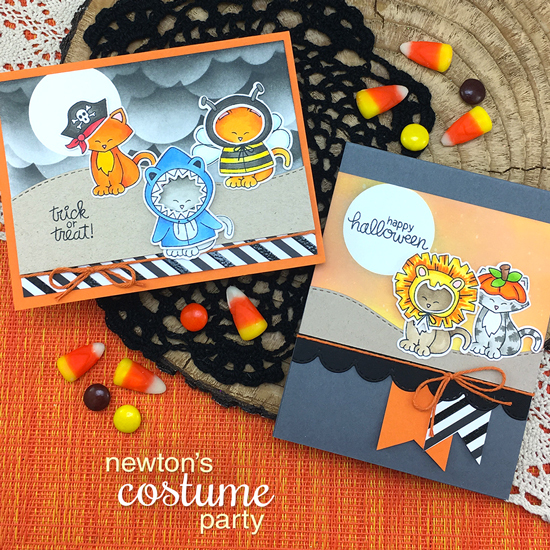 Dress Newton in your favorite costumes with cards by our Design Team! 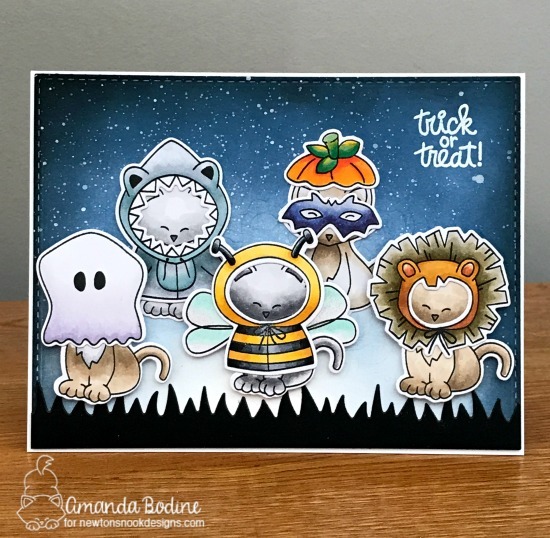 Amanda created a whole crew of kitties, dressed and ready to trick or treat! How adorable is that!? She also added some black grass along the bottom using our Land Borders Die Set. Tatiana dressed the kitty in a little lion costume, using masking to create a one layered image! She also added some clouds using our Sky Borders Die Set and some stars in the sky using the Starfield Stencil. 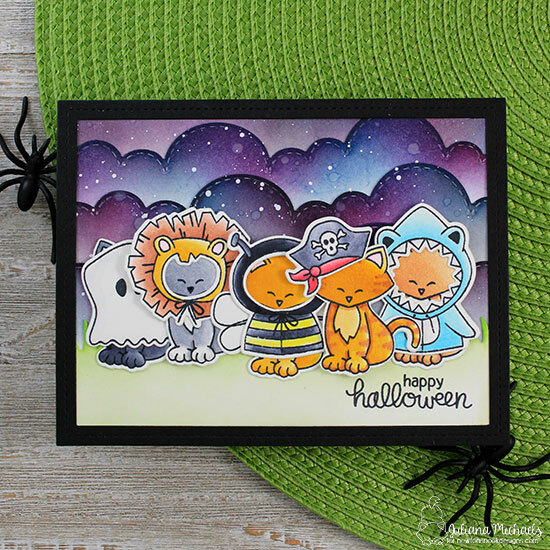 These cute kitties are all dressed and ready for trick-or-treating on this cute card by Juliana! She also added in some grass using our Land Borders Die Set and dark purple clouds using our Sky Borders Die Set. Newton is so adorable in his bee costume on this card by Jennifer! It's super cool how she coordinated the black and yellow papers with the bee theme too! This card by Samantha is so cute! Those kitties all peeking out of the circle with their costumes on look ready to celebrate Halloween! She also added some fun starry texture to her card using the Starfield Stencil. 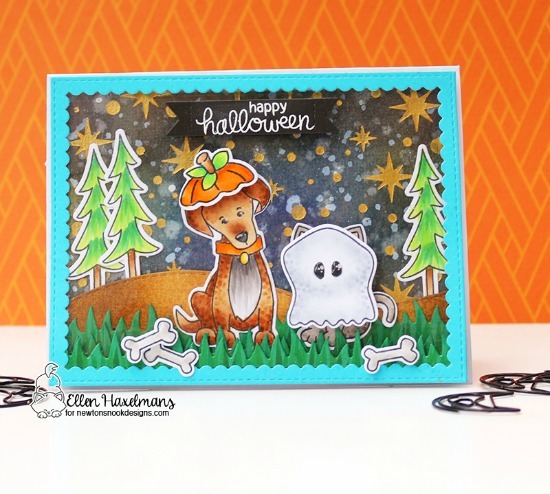 Ellen created this adorable Halloween Scene! 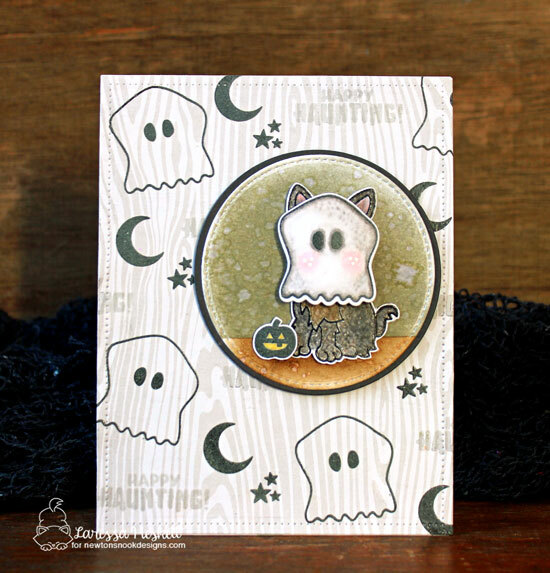 She dressed Newton as a ghost and then added a pumpkin hat to the dog from our Fetching Friendship Stamp set. She added in some die cut bones from the Fetching Friendship Stamp Set, some trees from the Fox Hollow Stamp Set and hills and grass using our Land Borders Die Set. She also added a starry sky using the Starfield Stencil. 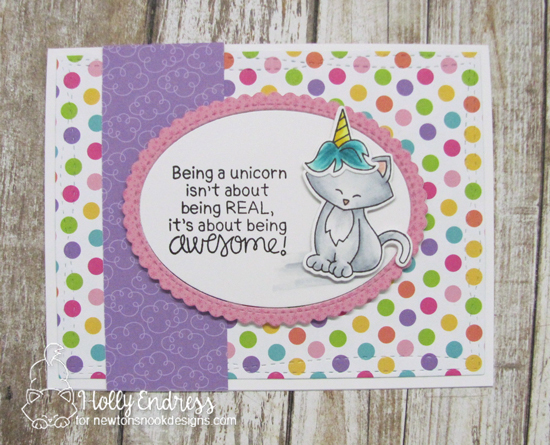 Holly created this adorable card, dressing Newton as a unicorn and adding in the sentiment from our Believe in Unicorns Stamp Set! What a fun idea! This shows how you could use the costumed kitties for other occasions besides Halloween! Although these costumes were designed to fit Newton, they can be added onto many of our other characters too! On this card, Larissa added the ghost onto the Terrier from the Terrific Terriers Stamp Set! How Adorable! Can't decide which costume you like best? 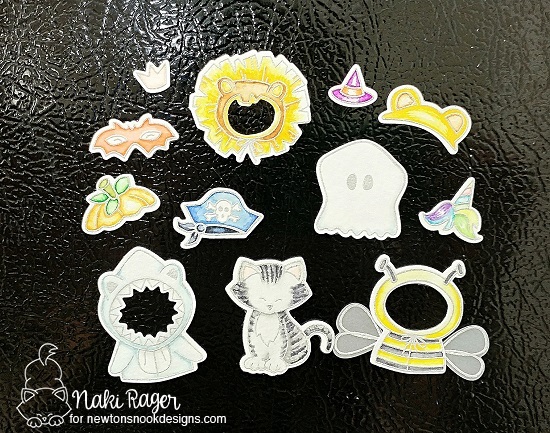 That's what happened to Naki so she created magnets of all the outfits so you can dress Newton up on your fridge each day in a different outfit! So fun! 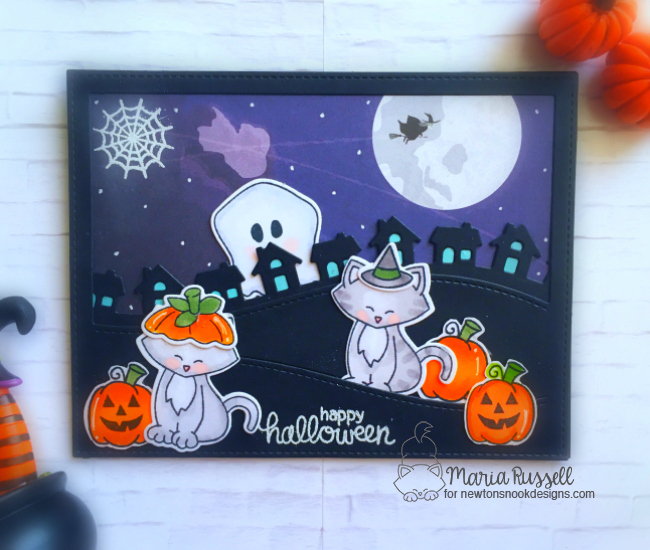 Maria created a spooky Halloween scene using two kitties wearing their halloween hats and one more in the background, dressed as a spooky ghost! She also added in pumpkins from the Newton's Perfect Pumpkin Stamp Set. Such a fun spooky scene! Would you like to win the “Newton's Costume Party" stamp set? Here's how to win:Comment on the NND blog and Design Team blogs (see list below)! The winner will be chosen at random from the collective reveal posts. Make sure to check out each of their blogs and comment for your chance to win. You will not know which blog has been chosen so the more you comment on the better your chances are of winning! You have until Thursday September 14th at 9pm CST to comment -- winners will be announced on the blog post on Friday, September 15th. Such a fun stamp set along with amazing inspiration from the design team. GREAT job design team! I can pick a favorite. This stamp set is so fun! Love it! Meant....Can't pick a favorite! oops! I LOVE this set!!! The costumes are all so adorable and there's so many possibilities! Plus, my son is in to sharks and he would get a kick out of Newton's dressed in a shark costume, especially since we have 2 kitties of our own! Newton in a costume... it doesn't get any cuter than that! These are all so fun! Love the samples! I'm in love with this set!! ADORABLE :) What sweet projects can be made with this. Even a "paper doll" set for little hands ~ I've in the past put magnets on the back of the die cuts for refrigerator paper dolls!! This is such an adorable and creative set!! And I love how you can use some of the accessories on the labrador too!!! YAY! Seriously, how cute is this!! Lovely card examples from the DT as well!! This set is so adorable and fun. Loving the inspiration pieces. I can't get over how adorable these are I fell in love with newtons costume party. This stamp set is adorable! I love it that Newton, and some of his friends, can get dressed up for Halloween! So super cute! This set is sooo cute! Love the costume selection. Oh my gosh - SO CUTE! OMG! Love this set! So Cute! Fun set and great cards by the design team! Thanks for the chance to win! Awww!!! Adorable critters!!! This is a lovely stamp set!!! Great new release, the little animals are so adorable, great job from the design team! This has been a wonderful release, and it keeps getting cuter and cuter! How cute is this??!! Love all the costumes. I don't know if I can handle all the cuteness and adorable stamps! how cute, all of the creations are great! Newton is my favorite stamp! and this stamp set is awesome! its on my wish list! I think this is my favorite set of the release. Very creative projects today. These costumes are just so adorable. LOVE IT!!! Great DT inspiration. What an adorable stamps set ! And very inspiring, from the cards presented. Love the fabulous September release! Everyone did a fantastic job! Lots of fun, lovely, inspiring cards from all DT!! !